ADP Ez labor serves all the small business in Canada having 1-49 employees. ADP ezlabourManager is a cloud-based time and labor solution that helps small businesses to automate the time and attendance processes and manage payroll preparation. 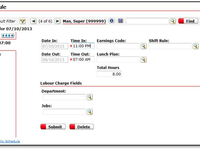 ADP ezlabourManager enables users to prepare payroll and helps maintain compliance with hour and wage laws. As a cloud-based solution the software is accessible in the office and remotely through any web browser. HR staff and managers can automate statutory holiday pay, paid time off including vacation and sick days. Comments: ADP is a good product that offers clients some valuable tools for payroll. The training provided by ADP is top notch. At times I miss ADP and the features of this product. Pros: I learned Payroll using this product. 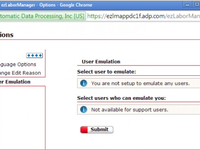 ADP is really great about providing training opportunities for software users. The training is quite in-depth and very valuable for those using the software. Support was readily available whenever there was a question. Absolutely loved the reporting side of the product. We had ADP handle all of our taxes and garnishments, and they made the process a breeze. It was really nice having a 3rd party overseeing what can be a daunting task especially when you are new to payroll. The support staff were always polite and courteous as well as knowledgeable. Cons: Some areas of the software program were quite complex and required additional training/assistance. Example would be year-end process, and creating reports are just a couple of items. We also noticed with updates, things would change within payroll. Example would be we had an employee on 2nd shift with a 3% shift differential. After an update the employee's shift differential was removed, and then at some point it added back a 5% shift differential. We also had some problems with the accruals. Pros: Booking time off is very easy for staff. Once you assign a schedule to an employee there isn't a lot that the employee has to do. Unless they ver from what's scheduled the system does everything for the employee. Cons: We have to extract our hours from ezlm on Thursday, so we have to have employee force through their Friday time. This causes many issues. Not always software related, more with our processes, but still a pain point. If would be great if we had a way to do a mass push through of the Friday at the end of the pay period. Pros: This is easy to access and all the functions you need are right there on the home page. You can quickly verify your clock ins/outs and make sure your time sheet is accurate. We use this to apply for PTO as well. Very useful product. Cons: The website appears slightly outdated and the buttons are a little small such as the sidebar on the right with all of the main options on it. I would expect those to be more prominent and easy to click coming from a UX background. 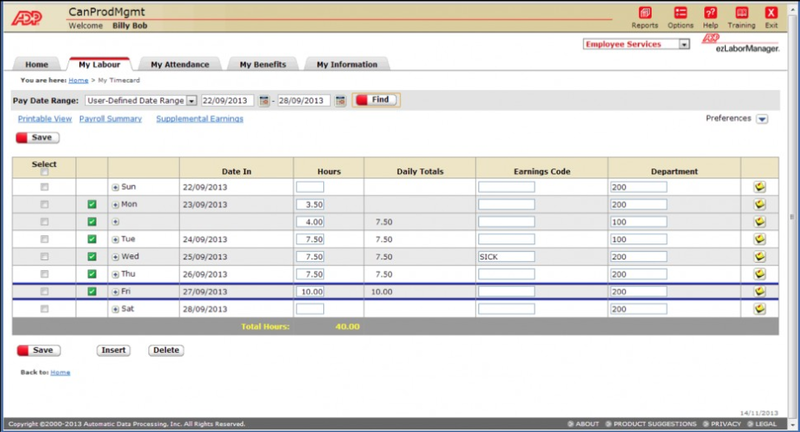 Overall: This software allows me and my team to easily see our time card and my pay stubs. I also use this daily to clock in and out and it is just as easy of not easier than a time clock. Also there is less cost since you do not need to buy more equipment like cables or a time clock. Pros: I love ADP! Navigating is very easy with the Home area with Clock in, Clock Out, Lunch Out, My Timecard and New Time Off Request button. I find with other software, you must search for these basic functions when it really should be right there. On the bottom, it shows the activity, and allows you to enter notes within the time card which is extremely useful when processing payroll. Cons: ADP seems to work hard on making it easy to do payroll or even take care of your own time card. Once you get used to the features and functions, it becomes very easy. Pros: This program is another by ADP which is great as it gives us peace of mind knowing that if we have any issues then we have them to rely on. That alone is a huge benefit. This program makes it easy to automate processes which used to take up valuable time from different employees. Cons: The program runs well enough that we don't really have any complaints with it. There are times it can run a little slow but it's not worth not buying over it. Sometimes there are rules we run into that we were unaware of that we have to figure out as we go, but it's a learning process. Pros: I have always enjoyed the perks and benefits that come with using ADP. Not only does it track your hours on a daliy, weekly, monthly basis but you can go back and review past months. It is always great for tracking your time off hours and requests. Cons: There are slight issues with it going down for maintenance which depending on the length of time and amount of employee's that use it, that would be troublesome. It is however, very easy to go in and correct missed or wrong punches. Overall: I have always been very pleased with the site. Pros: The customer service aspect of their service is great. They help resolve any issues I have. For the most part the website is easy to use and you can find things with relative ease. Cons: Their app could need a bit more work. Some things are not visible in the app for employees. For example you can either have the option of allowing employees to request time off from the app or be able to see accrued time off. You cant do both. Also supervisors cant see their staff accrued time either. Only admin users can. 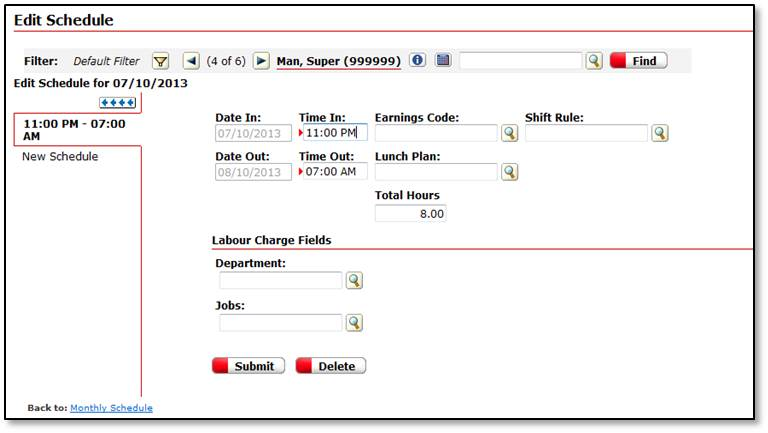 Adding this feature to supervisor would help with payroll and time off request. Overall: We are able to keep track of a lot more things and can get reports instantly with out much hassle. Saves a lot of time. Comments: Good support from the team. We can learn the system from ourselves. Does a lot. No need to sit in a class for a whole day to understand it. Cons: Starts to be more complicated when there are too many rules to enter in the system. Might not be that efficient to have to call the help center every time we need to change something in the system. Pros: I manage 6 student workers that usually work evenings and on the weekends when I'm not in the office. What I like most is that EzLabor is set up to only work on certain computers/IP addresses, so I never have to worry about them clocking in from home or somewhere else. Cons: It looks a little outdated, but looks aren't everything, it functions great. Overall: EzLabor is a great way to keep track of employees time. It's easy to use and there are multiple reports you can pull. Pros: This program makes it easy for employees to clock in and out daily and view timesheets for each pay period. The process to request and approve PTO is made simple and it track PTO balances. Cons: I have not been pleased with the customer service I received. If there's something I can't figure out I expect customer service to be willing to help me figure things out. Based on my experience with customer service that has not been the case. Pros: Self service feature is really amazing. Employees have many options to record their hours and they have mobile app for easy access and checking real time transactions. Cons: Nothing to say much. Only the maintenance schedule of the software once or twice a month. But overall, with all advance notification, employees are aware and have no problem with it. Overall: Our complex labor management report is now accurate in recording financial statements. Comments: Overall it works but the company can be restrictive what assistance they'll provide regarding deadlines or in correcting errors. Pros: Lots of standard reporting, that works efficiently and with high level of accuracy. Holds a lot of information in the system. Cons: The different platforms don't integrate well together (e.g. from payroll to HR). Information is lost and duplicates efforts. 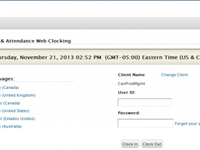 Time keeping systems with all the tools you need to track attendance and hours. Pros: Easy to use. Team is great to work with you on issues. Worked with our IT team to make sure we can everything in place prior to instillation. Also, we implemented a point system and the team helped us with this process. Much easier than the old way of tracking on a spreadsheet. Easy to use, gets the job done. Done deal. Pros: It's very easy to use and intuitive. Been using it for years now to clock in/out and review my time sheet. Cons: I haven't encountered any issue yet. The interface could use an update, to make it a bit more easy on the eyes and modern. But also, if it ain't broke don't fix it! Pros: I like that users can quickly see and keep track of things like days off and payroll. Our users have mentioned how east it is to use. Pros: It is easy to keep track of my staff's hours, make corrections to their time clock, and I like that we can use it at any computer or on a smart phone. Cons: It doesn't always allert me when my staff has missed punches. .
Pros: I like how easy it is to access benefits and work history through this software. This software is also very organized making it easy to find what you are looking for as a first time user. Cons: What I like least about this software is how you can get locked out of your account randomly. It could be an administrator issue but it happens more often than I would like. The software has a lot of features that are useful. Pros: The easy of looking up employees vacation time. I like one button that shows me who else is on vacation to see who else is on vacation at the same time. Cons: I Have to change my password three time a year. I have to keep track what password I am using. This means i have to write it down somewhere. Overall: I am able to see my the vacations of my employees at a glance. Pros: The Manager Home screen is an easy to use dashboard that notify's manager's of tasks that need to be completed. The reports are not difficult to set up, but when you have difficulties, the customer support team is very responsive and friendly. I like the format of the timecards. It is easy to review and make adjustments. The notes function is great for managers to notify payroll of any important informaton. Cons: There are some quirks to how my company processes the payroll, the format of the time file is not as customizable as I would like it to be. Overall: We use the biometric timeclocks with this software and feel that we are accurately collecting time data so we are compliant with wage and hour rules. Pros: I have used this software to punch in and out of work, very easy to use. Cons: The least I like is when the system is down. Pros: We use ADP time and attendance for our hourly and salary employees. It's easy to manage and as a practitioner, you can track hours and can pull reports on trends in each department. It is easy to put down notes and create pay codes for each situation IE: system outage, inclement weather. Cons: We found that a lot of our managers lacked training in the time and attendance. Our employees also found that the time and attendance feature was not the easiest to use when we originally got it. 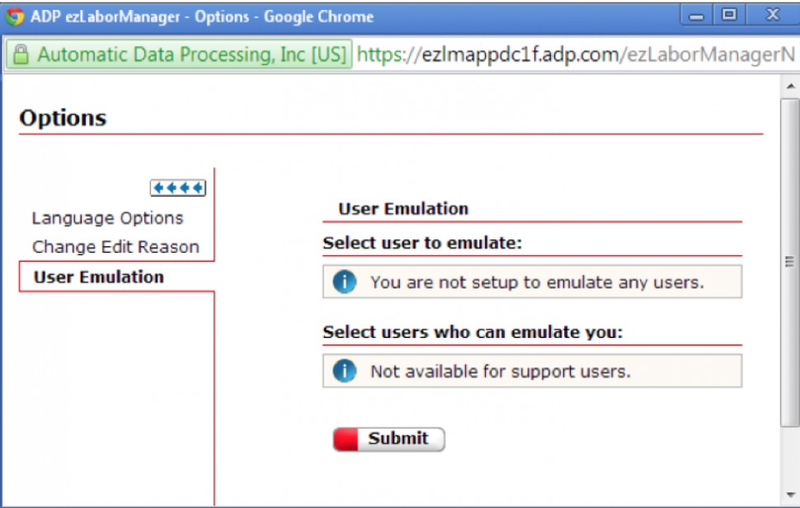 We have used ADP EzLabor software to manage all of our team member's timekeeping system. Pros: 1. Very easy to understand for managers to update time keeping oversights. 2. Love the feature of allocating different employees to different departments for reporting purposes. Cons: 1. It is not easy to initially comprehend and update. 2. Can not calculate week to date payroll costs. 3. No scheduling ability to understand cost of scheduling. Must be completed outside of ADP. Pros: Record hours and simply click a few buttons to transfer those hours directly into your payroll. Limits errors. Cons: Wish you could download timesheets, edit them on a master list, then upload the hours. It is too much to go through each employee and edit hours if the forgot to clock out etc. Overall: It is quiet good when it comes to tracking time off, timesheet details and easy to use. Pros: It's pretty straightforward once you know the ins and out and there's not much to do aside from the main things. Cons: Its very outdated in UI and sometimes data doesn't pull in as fast as you'd like. Pulling reports can also be a bit of a hassle. Overall: We are currently using EzLabor only for our hourly staff. So we probably have not even scratched the surface of it's abilities. It is very easy to use and I appreciate the flow of how it is set up for easy of finding things and approving time off. If we spent more time and asked more questions we could probably get a lot more functionality out of it so I do not want to put their software down for items we have not taken the time to set up. Cons: Low level of customer support for such a clunky, low-tech and non-user friendly product. Their is very poor project management for new clients and for changes. You never know who your going to reach via the support desk and you will never get a single point of contact for ongoing issues. Ez labor was the best part of ADP. My employees caught on well and it was easy to use for them. Pros: My Maintenance and Food Seevice employees do not work with computers much. With Ez Labor it was easy enough for them to grasps very quickly. 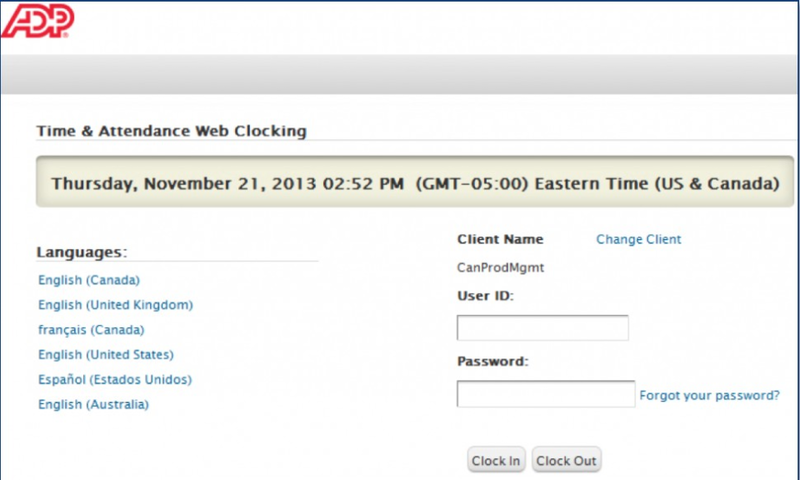 Overall: My employees could clock in and view hours easily. Great on the go software and app. Pros: The functionality of this software was easy and intuitive. The app made for fast access and input into the program. Cons: The price was not as competitive as other services, but functionality, support, and ease of use made up for the small price difference. Overall: It was quick and easy. It did not take very much time at all. Cons: It's very expensive, not very user friendly, you can run into red tape when you try to dismiss an employee. Pros: For the most part, it functions correctly. The backend functions all work, and the software does what it's supposed to to do. Cons: Extremely dated, extremely difficult to manage, uses ActiveX controls for the administration side with expired certificates. It's a security nightmare, and difficult to install. Support is very inconsistent. Pros: It does its job.... eventually. There is some support for hierarchies and structure. 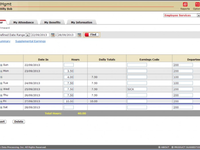 It integrates with other ADP products if you are using it for payroll and related stuff. Cons: It's a terrible user interface. It looks like it was created in the 1980s. The user experience is abysmal. All of the employees dread coming into this system to log their out-of-office hours. This is a prime example of a enterprise ecosystem that is not even trying at all to be user friendly. Pros: Asp was easy to use. Though I did not care for the batches it did make it easier to find when looking for something. Cons: The only thing I did not care for is the price of ADP. Ezlabor was a little difficult to learn but was easier once figured out. Pros: Simple to use, not too costly, does not require high powered PC, easy to export to the payroll system. Pros: Enables me to manage Canadian employees. Easy to approve time off requests and also lists all the holidays in one view. Long list of reports to pick from. Cons: Has the feel of "older" software. User experience doesn't feel seamless. I have to hunt and peck for features. Pros: I love how simple and straightforward this product is for clocking in and out of work. I mean I love logging into EZlabor at the end of the day because that CLOCK OUT is my favorite button. Comments: I'm pretty sure ADP just doesn't know how to write good software. It's like it's written by someone who just ad hoc a feature design list together and didn't ask a single person if it was easy to use. Cons: The interface is confusing. If you can't find something it's because you're in the wrong "mode". And clicking time off requests and scheduling is a pain. Pros: Cost is reasonable and affordable for new business. You have a lot of team support. Staff is very friendly. Cons: I haven't found anything I don't like yet. When you want your company set up the right way you have to do what you have to. Pros: ADP is the industry payroll leader - this service fits nicely into any size business to help ease the burden of payroll.